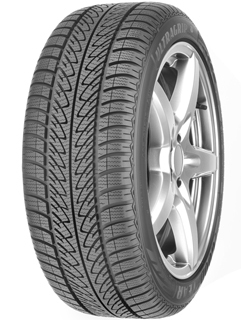 The UltraGrip 8 Performance provides superior grip, improved traction and braking on snow, thanks to the tyres unique design. The saw-shaped central rib of the tyre tread works like a snowplough, grabbing onto surface snow for extra traction. The silica tread compound maintains good grip at low temperatures. pecial hydrodynamic tread grooves quickly channel water away from the tire surface, helping you keep control on wet or slushy roads. The tyres light-weight design reduces the rolling resistance of the tyre therefore lowering your fuel consumption and CO2 emissions.